ordinary-looking actress, her face starts looking beautiful". In this page we take a look at some of the actresses (new & old) Lataji lended her voice to. For more details & Info click on the pictures of the actress concerned.The page is under construction I will be adding more actresses and links as & when possible. She is known as the 'Venus Of Bollywood'. Who can forget Madhubala in 'Aayega Aanewala' & 'Pyar Kiya to Darna Kya'. 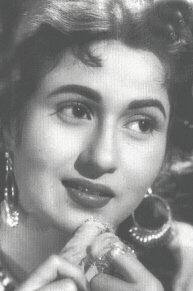 Her memorable films include Mahal, Chalti Ka Naam Gaadi, Mughal-e-Azam. The Queen Of Tragedy, Meena Kumari never used glycerine for tears in her scenes . Now thats what I call a true actress. Her Memorable films include Parinita, Sahib Bibi Aur Ghulam, Chitralekha & Pakeezah among others. Though Nutan never became the 'Numero Uno' but with her acting abilities in Bandini, Saraswati Chandra, Tere Ghar Ke Samne, Main Tulsi Tere Aangan Ki & Seema she achieved what only a few have been able to do so. She was a rage in the 60's and so were the Sadhana Cut, Chooridars & Jutis. Her popular films include Love in Shimla, Mere Mehboob, Woh Kaun Thi & Mera Saaya. She is the only actress in the industry who started with very small roles (vamp, second fiddle etc.) and later with her talent reached the top. She is remembered for her roles in Khilona, Do Raaste, Aap Ki Kasam. Like Yash Chopraji said "Sridevi can only move up. She has gone beyond the number game. She has acheived what only a few can." Her films include Sadma, Mr.India, Chandni, Lamhe, Gumrah, Laadla & Judaai. She is the 'Queen Bee of Bollywood' She has also been voted as the 'Actress of the Millennium' by a popular show on the Telly. Her films include Tezaab, Dil, Saajan, Hum Aapke Hain Kaun, Beta, Dil To Pagal Hain & Pukar. The Miss World/Model who with hardwork has proved that models can not only act but also rule the industry with films like Hum Dil De Chuke Sanam & Taal under her belt she sure has a long way to go.